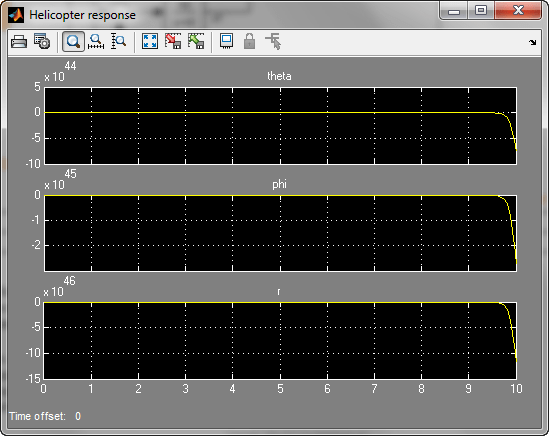 This example shows how to use slTuner and systune to tune a multiloop controller for a rotorcraft. The controller generates commands ds,dc,dT in degrees for the longitudinal cyclic, lateral cyclic, and tail rotor collective using measurements of theta, phi, p, q, and r.
Provide strong multivariable gain and phase margins (robustness to simultaneous gain/phase variations at the plant inputs and outputs, see diskmargin for details). 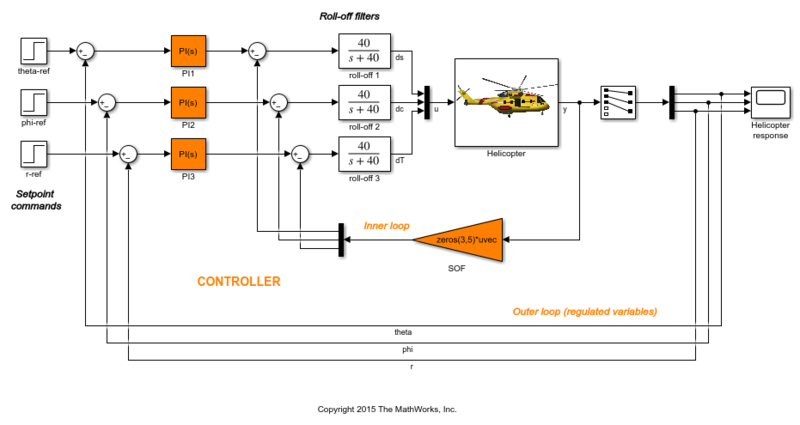 We use lowpass filters with cutoff at 40 rad/s to partially enforce the second objective. You can jointly tune the inner and outer loops with the systune command. This command only requires models of the plant and controller along with the desired bandwidth (which is function of the desired response time). 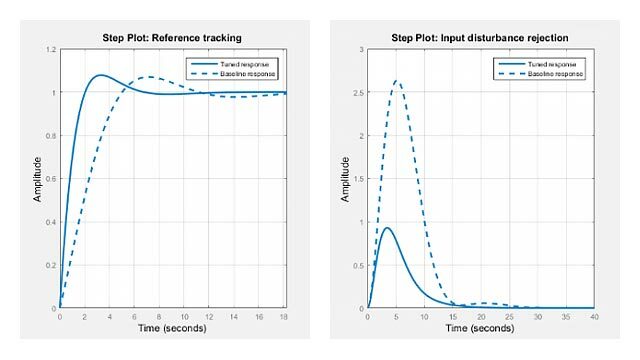 When the control system is modeled in Simulink, you can use the slTuner interface to quickly set up the tuning task. Create an instance of this interface with the list of blocks to be tuned. Mark the I/O signals of interest for setpoint tracking, and identify the plant inputs and outputs (control and measurement signals) where the stability margin are measured. You can now use systune to jointly tune all controller parameters. This returns the tuned version ST1 of the control system ST0. Inspect the tuned values of the PI controllers and static output-feedback gain. 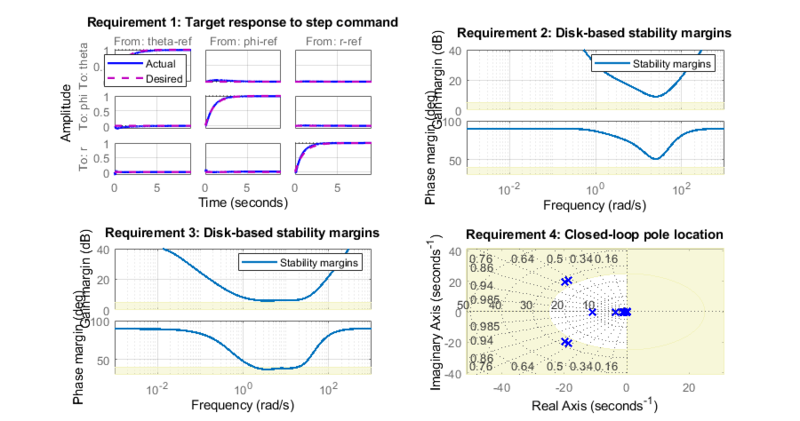 Then remove the SOF block from the tunable block list and re-parameterize the PI blocks as full-blown PIDs with the correct loop signs (as inferred from the first design). 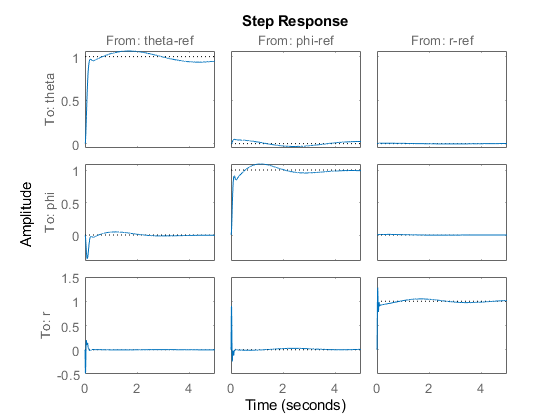 Re-tune the three PID controllers and plot the closed-loop step responses. 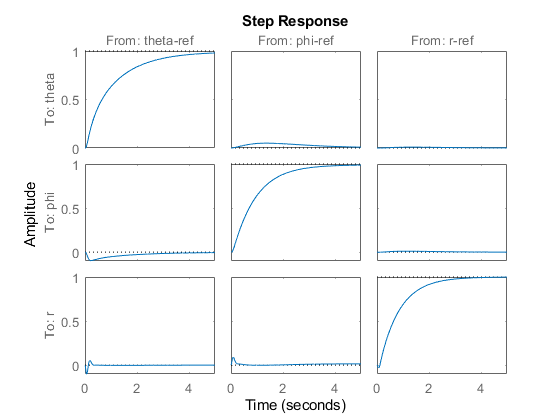 The final value is no longer close to 1 and the step responses confirm the poorer performance with regard to rise time, overshoot, and decoupling. This suggests that the inner loop has an important stabilizing effect that should be preserved.